A few weeks ago we made an awesome roadtrip with Nomad America with a four wheel drive through Costa Rica. We had the car for twelve days and after that we had one more week by bus. Because some areas are a bit more difficult by bus, we decided to go there by car: Uvita, Puerto Jimenez, Corcovado National Park, Rio Claro, Matapalo, Monteverde and Rincon de la Vieja National Park. In this article I’ll tell you everything about the camping spots that I recommend. Oh, and if you’re not sure about the car company, you definitely have to read this article about Nomad America, because they have the best cars ever (with rooftop tent!). From the office of Nomad America, somewhere in the area of Alajuela, we drove to Uvita. We didn’t stay in Uvita, but we drove a little further. We stayed in the Tortuga Hostel. And no, it’s not the typical hostel you have in mind: it’s in the middle of the nature and you have to go by four wheel drive to come here. It’s a beautiful spot, right next to a river, and the owners are really friendly. They give you the best tips: which beaches you should visit, but also which persons you should contact to go on amazing tours and which places you should visit. Their tips were really useful and the hostel had all the facilities: a kitchen, showers and toilets, and you can even do some laundry. I definitely recommend this camping spot (oh, and they also have rooms if you wanna sleep a little more comfortable)! Puerto Jimenez is the best place to go to if you want to visit Corcovado National Park, the best place in Costa Rica. Most people go to Drake Bay, but this village is actually way better by car. And the village is really nice as well, with a lot of restaurants, cafes and a harbor. We were sailing on the water and saw a lot of dolphins, and we chilled with a beer in one of the restaurants. We slept at Camping Adonis, which is actually just a lawn with two showers and two toilets. The owner has two crocodiles and these two have more than thirty babies, how cool is that?! And on the camping we saw a lot of big lizard and exotic birds. From the camping you walk to the centre in two minutes. The Corcovado National Park is the highlight of Costa Rica if you ask me, with a lot of wildlife. Unfortunately we had to leave our car for one night to go on a two day trekking through the park. The advantage of going with a car of Nomad America, is that you can conquer the path to the entrance of the park so you don’t have to sit in a creaky bus for two hours. After the trekking we stayed in Puerto Jimenez for one last night and then we drove to Rio Claro. After searching for a long time, we finally saw a REALLY good camping spot. It was actually the best spot during our roadtrip through Costa Rica. We stayed at Cascadas las Cavernitas, which is all about huge waterfalls. There was no one around and we had the waterfalls all to ourselves, which was really cool. We heard the water thundering down while we’re laying in our tent. Definitely a spot the I recommend! In Costa Rica you can find two Matapalo’s: one close to Puerto Jimenez and one close to Uvita. We slept for one night at Matapalo close to Uvita, right on the beach. Also this place wasn’t a camping, we just decided to go for wildcamping. We parked the car in the middle of some palm trees and in the morning we woke up with a beautiful sunrise. We took a swim in the sea, putted down our tent and we drunk a coconut before we drove to the next spot. This sounds like paradise and it was paradise for sure, but I didn’t feel that safe that night. In the morning I realized I was just overreacting a bit, but hey… you never know. The next spot was Monteverde, where we stayed for two nights. This is very easy to reach by bus, but for our route it was the best to go to Monteverde, because it’s at the west of Costa Rica. We were staying at a really nice camping: Restaurante Camping Turin. It was the best spot to read a book, drink a glass of wine and just do nothing. 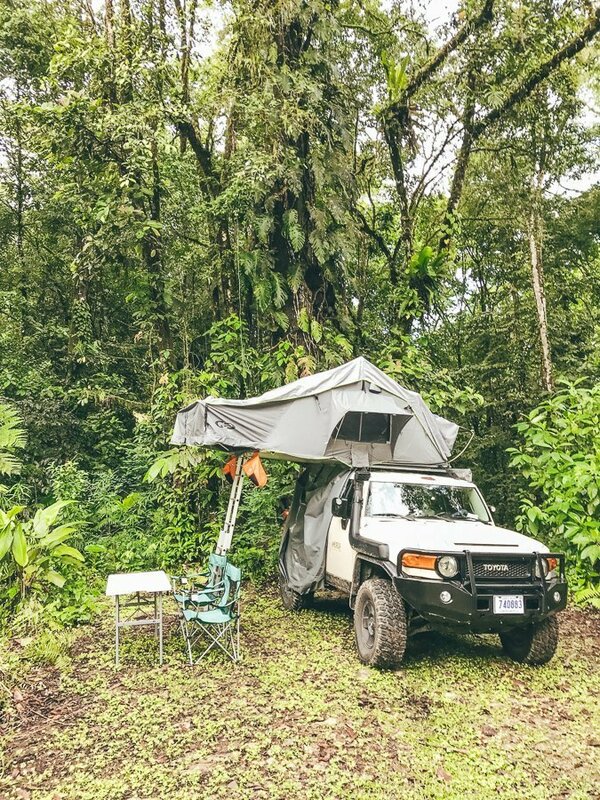 It was one of my favorite campings of Costa Rica. From here you reach the Monteverde Cloud Forest within half an hour and you can do some other awesome trips in the environment. 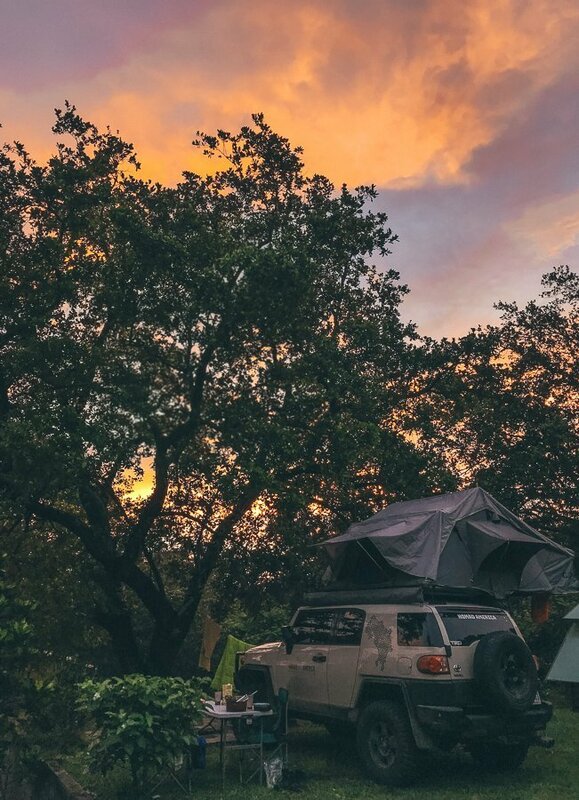 The drives around the camping are awesome as well: you have to drive through the mountains and you have the best view over rolling hills and green valleys. Gorgeous! The last two nights were also really nice. We stayed at the camping El Sol Verde, which is owned by a Dutch guy called Gerard. 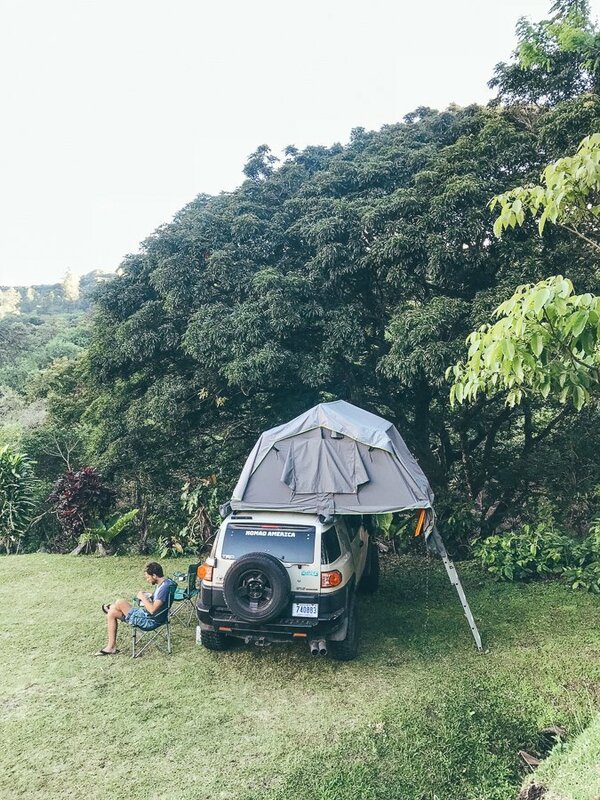 The camping is really close to the Rincon de la Vieja National Park in the north of Costa Rica, so it’s the perfect base for a visit. The sun is always shining in this part of the country and the temperature is always around the 30 degrees Celsius, so that’s perfect for some ultimate relax days. But don’t forget to go to the park, because you can make some really nice hikes over here. 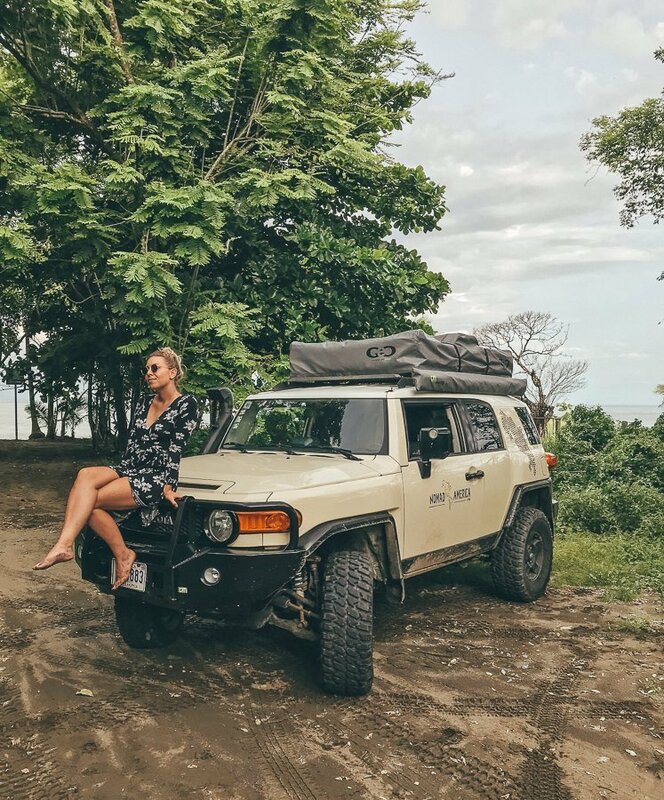 Are you excited to go on this roadtrip adventure through Costa Rica? 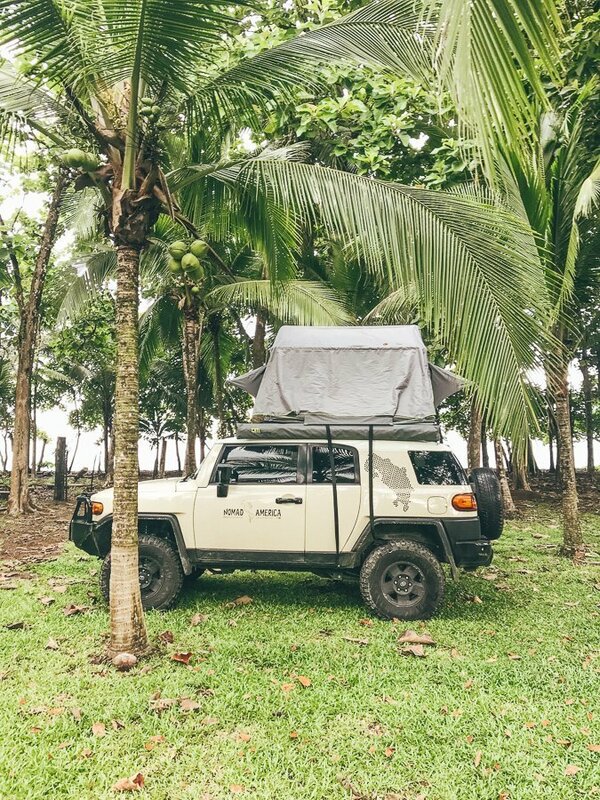 Just read my article about roadtrippin through Costa Rica, where I’ll tell everything about campings in general, wildcamping, which car rental you should choose and more. Roadtrip Costa Rica: which car rental company is the best?